Over the course of his dynamic career, multi-instrumentalist singer and songwriter Eddie Dillon has penned more than 1,000 original songs. Recently, Dillon set his sights on bringing three of his original works to animated life. He commissioned Artist/Producer Glenn Alexander to create the work. The result is outstanding collaboration in visual and performance art. The three songs – Armadillo’s Waltz, Jack the Mouse, and It’s Tough to be a Spy – are witty numbers nuanced with a bit of dark humour, and Alexander didn’t miss a beat in illustrating the subtleties. The animation and the music are a perfect combination! 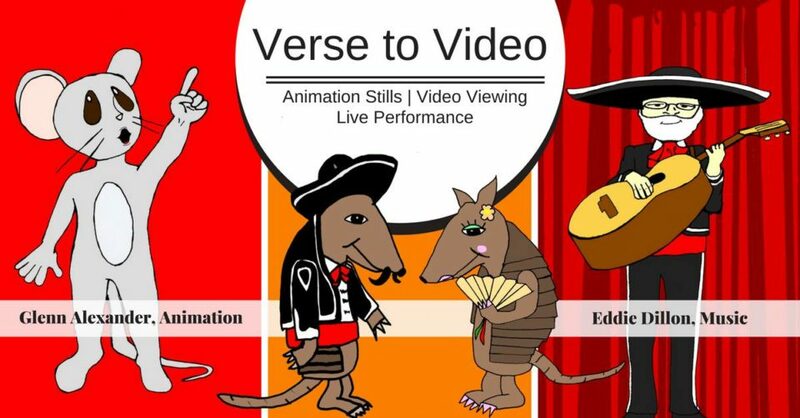 Join us for the illustration/video stills exhibit, video viewing and live performance on Friday, August 24 – lite refreshments will be provided. You don’t want to miss this at the Co-Creative Center, 141 Union Street in New Bedford!